There are very few belongings that we intend to keep forever. The coffee maker will be replaced, as will the car, the couch, and even your favorite pair of blue jeans. But your engagement ring and wedding band will be worn for a lifetime. Even if at some point you choose to have them remounted into new rings, you will most likely wear each set for a very long time. Some accidents can’t be avoided, of course, but there is much you can do to make sure your rings last through the years. Rings with lots of small diamonds set in micro prongs or pave’, like this set, are prone to loosing gems. Regular trips to the jeweler will help ensure the little guys (and big guy!) stay in tact. Let’s start at the very beginning: Purchase well constructed rings in the first place! Do your research and find a jeweler you trust from whom to purchase your wedding band and engagement ring. This isn’t merely to ensure the quality of the gemstone. While that is important, it isn’t the most important. The size and carat of a diamond does not contribute to the durability of your ring—the quality of the craftsmanship does. So don’t skimp when it comes to that. In most cases, you really do get what you pay for. Once you are satisfied with the quality of the rings and are wearing them full time, remember to take care of them on a daily basis. It’s not just cleaning them, which we’ll get to, but it’s about taking those babies off when doing anything that will be unusually tough on your hands. Removing your rings is sometimes necessary to avoid damage and maximize longevity in certain situations: gardening, lawn care, doing dishes, cleaning, lifting weights, kickboxing, rock climbing, or in my case, fabricating jewelry, to name a few. A good thing to remind yourself is that everything you do with your hands, you do with your wedding band and engagement ring. So just imagine the natural wear and tear you’ll accumulate over decades of use. I also recommend taking them to a jeweler for a quick check and cleaning (Professional cleaning tools like an ultrasonic are amazing at achieving maximum sparkle!!) every six months. While at the jewelers, make sure to take advantage of their knowledge and have them check your rings for wear, damage and loose stones. They can advise you if they find any damage on how to proceed. You can have your rings cleaned—or clean them yourself—more often, of course, just be careful not to over clean your jewelry, particularly if you have setting styles such as pavé or micro-prong. The vibrations from an ultrasonic can loosen the small stones if those settings are cleaned too frequently. 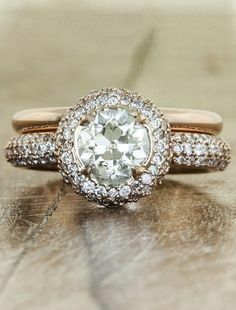 If you choose to clean your rings at home, I recommend soaking your rings in warm water for five to ten minutes then using mild dish soap and a soft toothbrush give them a gentle scrub. Don’t forget to scrub the undersides rings, especially behind gems, this is where most of the dirt hides! Tip: The most common area of wear and damage on rings is around the prongs. They tend to become worn down and get knocked around over time. Make sure you have a professional check your rings for this kind of damage. They will notice issues where you might not. It’s much more cost effective to have them repaired than to be forced to replace gemstones because they fell out of damaged prongs. 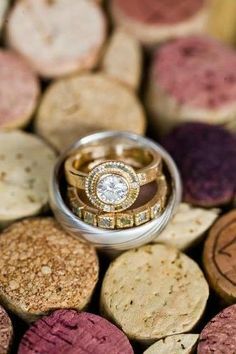 If you’re not married yet, this a great ring shot! Over the years, it’s great to have your wedding ring set polished and refinished once in a while. They will look new, fresh, and beautiful! Scratches will be removed, finishes replaced, and even engraving redone, if you so choose. However, you shouldn’t have them refinished more than once every nine months to a year. This is because every time a ring is refinished, a very, very small amount of metal is removed from its surface. So if you have your rings refinished every four months, for example, you will begin to wear your rings down prematurely. Following these easy rules of thumb will maximize the life of your wedding rings. So be mindful of them, clean them, and have them checked by a professional regularly and repaired accordingly. Your rings are a symbol of your lifelong commitment and love, so give them the respect and care they deserve!